It’s pointless and stupid to complain about films that don’t get nominated for the Oscars… so obviously I’m going to do it anyway. But first I need some help. 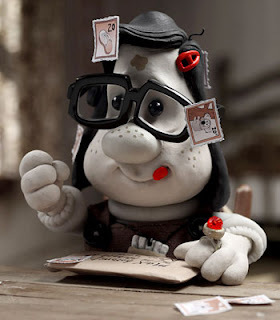 Can anyone who has seen all five of the films shortlisted for the Academy Award for Best Animated Feature (Secret of Kells, Coraline, Fantastic Mr Fox, Princess and the Frog, and Up) tell me if all of them are better than Mary and Max? Obviously there are the usual elements of taste, studio clout and politics to navigate in order for a movie to get nominated for an Oscar, but I’d be truly surprised if all five nominated films are artistically, emotionally and comically superior to Adam Elliot’s genuinely touching and brilliantly rendered masterpiece. I doubt Princess and the Frog contains many suicide attempts. In the end the award went to Pixar’s Up. Congratulations to them - it was fun and technically stunning in parts. Still for me Carl, Kevin, Dug and Russell felt too much like McHappy Meal toys waiting to happen. No matter how cute I think it would have been, it’s hard to imagine McDonald’s giving away little colour-free plastic figurines of poor lonely Mary Daisy Dinkle or podgy middle-aged Asperger’s sufferer Max Jerry Horowitz to over-stimulated munchkins to play with as they stuff burgers down their throats. Still, everything has its place and, Melbourne being Melbourne, there is now an opportunity for children of all ages to celebrate the maudlin glory of Miss Dingle and Mr. Horowitz at the Australian Centre for the Moving Image (ACMI) in Federation Square. 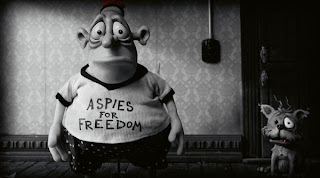 Mary and Max: The Exhibition is a free event from 2 March - 6 June 2010. Visitors can check out plasticine character models, costumes, sketches, sets, storyboards and props up close, as well as footage of the animators at work. You can also design and submit your own plasticine folks as part of their Create a Character competition, with signed prints and DVDs up for grabs. Given Adam Elliot’s loving recreation of 1970’s Melbourne in the movie it’s nice to see Melbourne give a little back, so for those who can get there, please do. Full details of the exhibition are available here. 3. George Clooney's voice is like hot chocolate. Mary and Max seems very dark. I don't really like watching films that make me cry, if I want to cry I just think about my life. Nah, not really hurting. I just have a tendency towards hyperbole and proclamations of self-righteous outrage on here that probably makes me sound emotionally overwrought! I just like seeing good things get recognition I suppose. I’m looking forward to seeing Fantastic Mr Fox… I love Wes Anderson and Roald Dahl so have no doubt it’ll suit me nicely. It’s just that I doubt that all five nominated movies were better than M&M. You should see it though. It’s inspiring more than it is tear-jerking – promise! Oh oh oh oh I forgot to say...I see Jarvis Cocker is in your official list of interests - he is in Fantastic Mr Fox - they make a little doll of him and everything - and he sings a song. Come ON, that's gotta help.